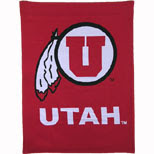 Paperclippings Blog: I'm a UTAH man...(woman) OH YA! Paperclippings Blog: I'm a UTAH man...(woman) OH YA! Saturday at Rice-Eccles Stadium in Salt Lake City the underdog University of Utah Running Utes out play the Bruins of UCLA for a final score 44 to 6. A Utah man, sir, and will be till I die: Ki! Ki! We're up to snuff: we never bluff. We're game for any fuss. No other gang of college men dare meet us in the muss. So fill your lungs and sing it out shout it to the sky.